In recent years, due to the mass retirement of skilled workers, loss of expertise has emerged as a problem in Japan. Meanwhile, the performance of computer hardware has been drastically improving. Skill-based PID controllers utilizing a database have been proposed as a potential solution to this problem. However, these controllers may not respond to multiple demands of control performance from users because the controller was not considered in the evaluation from the users. As a solution to this problem, an expert controller based on a skilled worker’s operating information with control performance assessments has been proposed. According to the method, I/O data, PID parameters that are estimated using the operating data and evaluation values of the skill of the skilled worker are stored in the database. From this, information vectors with high scores are selected, and a local PID controller is designed in response to the user’s requirements. In the conventional research, the least squares method is applied for estimating the PID parameters from the operating data of the skilled worker, and there are no restrictions on their values. This risks a loss of physical meanings of PID parameters in the case that they have negative values. In this research, an expert controller using particle swarm optimization (PSO) is proposed. In this method, data obtained by human control of a control simulator constructed on a computer is used to estimate human’s skill as PID parameters. Moreover, providing restrictions for the estimation of PID parameters enables them to preserve their physical meanings. In this research, the effectiveness of the proposed expert controller is verified using a control simulator. 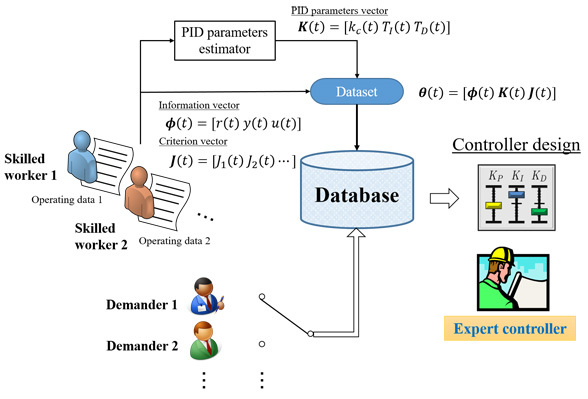 H. Matsumori, S. Wakitani, and M. Deng, “Design and Application of a Data-Driven Expert Controller Based on the Operating Data of a Skilled Worker,” J. Robot. Mechatron., Vol.28, No.5, pp. 730-738, 2016. A. Stenman, F. Gustafsson, and L. Ljung, “Just In Time Models For Dynamical Systems,” Proc. of the 36th IEEE the Int. Conf. on Decision and Control, Kobe, Japan, pp. 1115-1120, Dec. 1996. Q. Zheng and H. Kimura, “Just-In-Time PID Control,” Proc. of the 44th Japan Joint Automatic Control Conf., Yokohama, Japan, pp. 336-339, Nov. 1996. N. Nakpong and S. Yamamoto, “Just-In-Time Predictive Control for a Two-Wheeled Robot,” Proc. The 10th Int. Conf. on ICT and Knowledge Engineering, Yokohama, Japan, pp. 95-98, Nov. 2012. G. Bontempi, M. Birattari, and H. Bersini, “Lazy Learning For Local Modelling And Control Design,” Int. J. of Control, Vol.72, pp. 643-658, 1999. J. Zhang, Y. Yim, and J. Yang, “Intelligent Selection of Instances for Prediction Functions in Lazy Learning Algorithms,” Artificial Intelligence Review, Vol.11, pp. 175-191, 1997. T. Yamamoto, K. Takao, and T. Yamada, “Design of a Data-Driven PID Controller,” IEEE Trans. on Control Systems Technology, Vol.17, No.1, pp. 29-39, 2009. S. Wakitani, K. Nishida, M. Nakamoto, and T. Yamamoto, “Design of a Data-Driven PID Controller Using Operating Data,” Proc. of the 11th IFAC Int. Workshop on Adaptation and Learning in Control and Signal Processing, Caen, France, pp. 587-592, Jul. 2013. M. Kato, T. Yamamoto, and S. Fujisawa, “A Skill-Based PID Controller Using Artificial Neural Networks,” Proc. of Int. Conf. on Computer Intelligence for Modeling, Control and Automation, Vienna, Austria, pp. 702-707, Nov. 2005. S. Mori, A. Sakaguchi, and T. Yamamoto, “Design and Experimental Evaluation of a Data-Driven Skill-Based PID Controller,” Proc. of Advanced Intelligent Mechatronics, Zurich, Switzerland, pp. 1-5, Sep. 2007. K. Koiwai, K. Kawada, and T. Yamamoto, “Design of a Human-Skill based on PID Controller Using Cmacs,” Proc. of 2008 Int. Conf. on Control, Automation and Systems, Seoul, South Korea, pp. 64-68, Oct. 2008. S. Wakitani and M. Deng, “Design of a Data-Driven Expert Controller,” Proc. of the 10th Asian Control Conf., Kota Kinabalu, Malaysia, pp. 1019-1022, May 2015. J. Kennedy and R. Eberhart, “Particle Swarm Optimization,” Proc. of IEEE the Int. Conf. on Neural Networks, Perth, Australia, pp. 1942-1948, Nov. 1995. K. Takao, T. Yamamoto, and T. Hinamoto, “A Design of Memory-Based PID Controllers,” Trans. of the Society of Instrument and Control Engineers, Sapporo, Japan, Vol.40, No.9, pp. 898-905, 2004 (in Japanese). C. G. Atkeson, A. W. Moore, and S. Schaal, “Locally weighted learning for control,” Artificial Intelligence Review, Vol.11, pp. 75-113, 1997.